Responses: John James Audubon’s Animals And Birds. 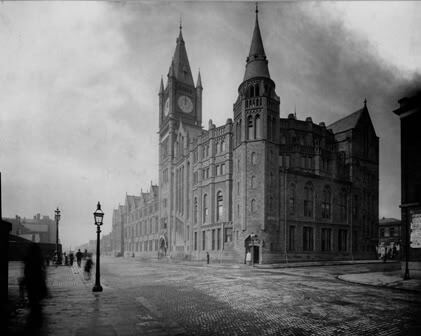 On a day where an unusually hazy rain persisted in a constant downfall, I took refuge in the redbrick building of the Victoria Museum and Gallery that lies at the top of Brownlow Hill. The building sits in sharp contrast to the more medicinal university buildings which surround it, one being brutalist in its strange edges and institute sensibility, the other being passive-aggressive in its over-welcoming, post-Millennium curvature. 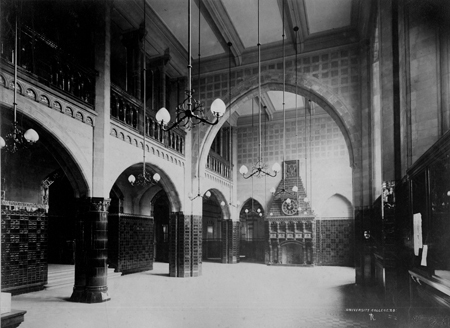 The Victoria Gallery was, contrary to my prediction that the place would be little haunted beside a few accidental wanderers, filled to capacity in its lower cafe section and restaurant; bustling to a level that meant staff were playing the role of maître d’, guarding potential incomers from sitting down until doing so upon their own invitation. My chance visit, however, was not so much a random act but a subconscious one that took swift advantage of the moment of the downpour. For upstairs in the gallery, I knew there to be a current, perhaps permanent, exhibition of the work of John James Audubon; the American ornithologist and naturalist whose 19th century paintings bare an intriguing but horrific under layer of the social calamity in which he worked. The building has a sense of opulence to its staircases, befitting that of a vast, labyrinth mausoleum. It feels like a parting gasp from a dying colonial ideal, it protests a fin de siècle burn out. This gave a sharp contrast to the room in which Audubon’s work is actually situated; a cramped and darkened space, almost deliberately concocted to portray the reality of the work’s morbidity and the dark-wood veneer of the early 1800s. The paintings of Audubon are not, unlike the often photorealistic works of modern-day plates and wildlife identification, of some real or accurate character. On the contrary, they portray a twisted vision of nature through an uncomfortably domineering perception. The relationship is not one of observation but one born of stalking and killing. So many of Audubon’s pictures, including ones not housed in the Victoria Gallery, show birds and animals so unnaturally contortioned as to be almost inevitably produced from the dead animal itself, rearranged into some caricature of existence and sentience. Audubon’s work is a resurrection feat but not one with positive outcomes, only a horrific blend of the re-animated but with their body still suffering the malediction of its fatality. The birds are often imbued with personified characteristics, portraying the tortured faces of unnamed personages morphed onto avarian equivalents. Their necks are turned in unnatural directions to the point where it can only be assumed that it has been broken. They look angry, strangely snarling, sharing in the realisation that they have been brought back to life and left to sit in humiliation as their bodies are parodied in painted form. This could be accounted for with Audubon’s predilection for hunting of various kinds, no doubt his experience of wildlife being one often of animals in desperation to escape him accompanied occasionally by the various methods of killing that sometimes make their way into his pictures. The room has a mock-up work desk, doused in pieces of Victoriana which rather surreally go so far as to include various examples of taxidermy which also reside in some of the adjacent draws. The birds are ragged, clearly of some great age, though they still retain more of their actual character than the paintings around them achieve. Perhaps most alarming is Audubon’s painting of an otter, dated from 1826 and titled Otter Caught In Trap. Audubon’s paintings of mammals are more stark than his bird pictures, the elements of the hunt, the desperation being emphasised to the point of farce. 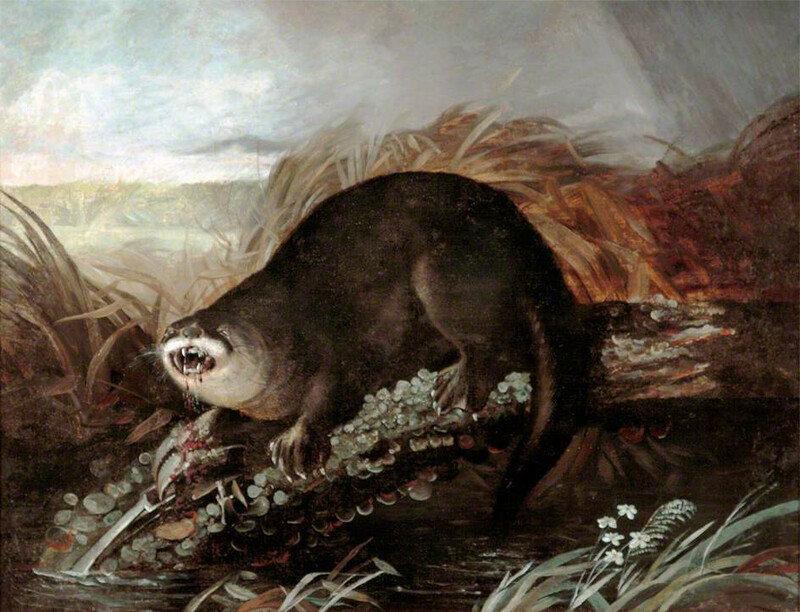 The picture in question shows the otter as a blood-thirsty monstrosity though little in the painting suggests that this attitude is born of the metal trap that is biting into its right paw. Many set-ups have the aura of a taxidermy already in process and as Audubon’s skill in the area is often noted, it is likely that the poor specimen is only being slightly distorted; its own body probably gathering dust and falling gently to pieces in some other collection of Victorian memorabilia. Thoughts meandered as to what this man’s work actually reflected: what caused the brazen lack of awareness as to the startling morbidity and the stifling moral indifference which surrounded his prolific but cruel endeavours? It occurred that Audubon’s history may reveal some sense of distance at the very least and research proved the underlying feeling to be correct. For Audubon’s father had made the majority of his wealth, money which he used to fund his son’s interest and initial businesses, in the slave trade. Audubon himself began his own business venture using slaves in a flour mill before the project collapsed due to the 1819 financial panic. If not for this, he may have become a wealthy man and not the naturalist who was later jailed for economic debts. Upon learning these facts, I visited the room again on a day bearing only slightly better weather. It occurred that the artefacts of the battered, dead animals were brought to life and forced to suffer a humiliation akin to the character in Edgar Allen Poe’s The Facts In The Case Of M. Valdemar (1845) who bears witness to operations on his own deceased body while still being mentally alive. The dust in the air was ever more prevalent, the birds in the room decomposing into their surrounding plastic cases and bell jars; Plath’s entrapment and subsequent mental anguish also coming to mind. Yet, the work in the room also bore another deep fog, misting over the grossly intensified impressions of animals. The fog was made up of the realisation of persecution that the mammalian and avarian specimens were reliving, almost seeming a reflection on beings that simply resisted the will and power of the man; an act which lead Audubon to render them as unsympathetically vicious, bloody, and snapping. The paintings reflect his society’s righteous outlook and indifference of ends with a deeply disturbing confidence. A copy of Alexander Falconbridge’s An Account of the Slave Trade on the Coast Of Africa (1788), a pivotal tome in the abolition movement, was held in a cabinet in the adjoining room for a separate exhibition. Forty years later from the year of that book’s publication, Audubon finished his own first book, Birds Of America, also being the same year that slaves’ “apprenticeships”[i] ended. I left the gallery and it started to rain again outside, the water never feeling so refreshing and welcome as a further downpour ensued. [i] The grotesque name change given to those in slavery over the age of 6 as a plan to phase out slavery after the 1833 ban.